Care Transition Communication is Broken. Knowledge is power. To reduce risk and improve care, CMIOs, Care Managers, and Pop Health executives need to know when patients have healthcare encounters. Unfortunately, they’re often kept in the dark. Healthcare isn’t simple, but we think improving care transitions can be. Cureatr’s Care Transition solution makes it easy to see the full picture of a patient – where they’ve been, who has treated them, for what, and where they’re going – so you can do more to affect their care, now. Subscribe to a patient roster to get a specific population’s healthcare encounter feeds. 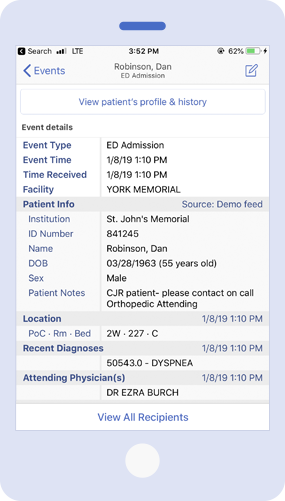 Connect to receive real-time notifications when a patient receives care anywhere in your region. Coordinate with others on the care team via real-time secure messaging the way you communicate every day: with the smart phone in your pocket, or via the same application in your computer’s web browser. Automated alerts to patient ED arrivals, admissions, discharges, and transfers in real-time. Wide access to facilities your patients may visit - any with an ADT feed are possible. 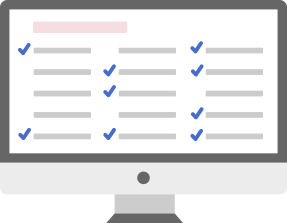 Clinical checklists triggered off of alerts that standardize and streamline care, case to case. An organizational directory that lets you know who’s on call and who’s unavailable. HIPAA-secure messaging including secure photo & file sharing. Simple integration, simply plug in your facility’s data and go. 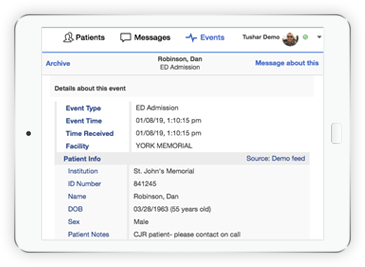 With clinical event notifications, transition notifications and secure messaging that helps clinicians connect with each other and connect the dots of patient care. Be in the Know, On the Go with real-time notifications and secure collaboration with care teams that works the way you do – in-the-moment, on your way, on your phone, tablet or desktop. 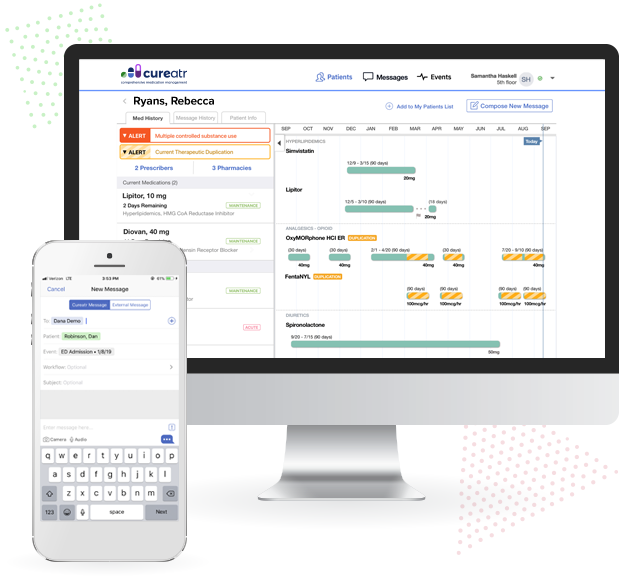 Connect Across Networks, anywhere in your region patients seek treatment with software that bridges the data disconnect between hospitals, IDNs, home care providers and skilled nursing facilities, reducing duplicate treatment, tests and hospital stays. Safely Send Files & Share with Teams conversing and connecting in real-time with other care team members as well as securely sending critical photos and files, strengthening the chain of care. 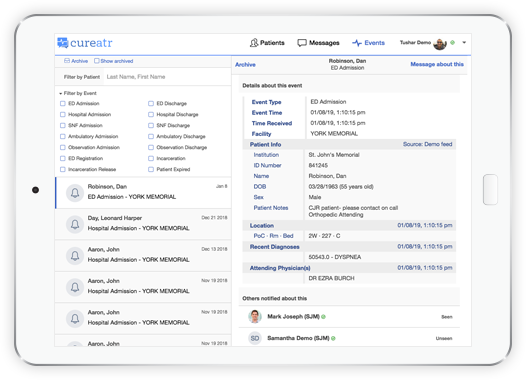 See how Cureatr can help your hospital or practice see a more complete picture of your patients with a free product demo.